So much time has passed since I've last posted. Is there guilt? Yes. Do I feel terrible about it? Not so much. (But I do feel guilty for not feeling that way!) What can you say though. Three kids, homeschooling, extra curricular stuff, traveling, military life, a new dog, my going back to school....I could go on! Let's just say...I'll try better! 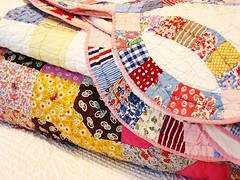 Isn't this quilt pretty? I'd love to make something like that with all my scraps, but the idea is intimidating! I'm not that great with following directions, and do I fear it would come out looking less like a wedding ring quilt and more like a crazy quilt. I'll have to search out some good quilting books!